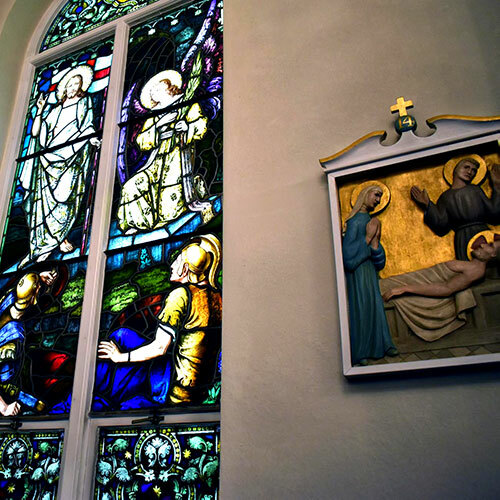 The story of Saint John of the Cross Catholic Parish begins with the efforts of Catholics to establish first a mission and then a parish in Middlebury, Connecticut. The baptismal records of the Church of the Immaculate Conception in Waterbury indicate that there were Catholics living in Middlebury as early as 1864. In subsequent years, St. John of the Cross, as well as its sister church, St. Teresa of Avila, in Woodbury, would become mission churches of St. John the Evangelist Parish in Watertown. On August 23, 1904 St. John of the Cross Parish was granted ecclesiastical status and the Certificate of Organization was officially signed. However, a decade would pass before the newly constructed stone church on the Middlebury Green was dedicated on November 22, 1914. The first resident pastor, Reverend William Judge, was assigned on March 1, 1916. Fr. Lawrence Symolon, a Connecticut native, and former Pastor at Holy Angels in Meriden, Connecticut, was appointed Pastor on June 30, 2017.